For the longest time… I was afraid of eggnog. I don’t mean I would just turn my nose up at it, I mean, seriously, I thought if I had just a sip it would be the most horrible thing I ever drank and some unknown terrible thing would happen (like projectile vomit). Somewhere deep in my memory bank is a loop of a slovenly drunk man chugging eggnog from a carton and hurling all over the place. This was the image that my mind conjured up when I heard the word eggnog. At some point in the last 10 years I was convinced by some person that what I really needed was to make it from scratch and try the “real thing” and it would be a life changing experience. Maybe it was Alton Brown. At least, that was the first recipe I consulted when I made it for a holiday party a number of years ago. And holy crapballs it was delicious. Like custard, but lighter, and drinkable and somehow nothing about it was what I was expecting. I think that I was preparing to drink a cocktail the consistency of pudding and have it taste of raw eggs.. this, this cocktail, and I say cocktail because there was copious amounts of liquor in it, it was so good. Now, despite my complete transformation on the drink, there were still people at the party who were in the former camp and nothing I could say would convince them to try it. Nevertheless, the punch bowl of eggnog was emptied at some point, and found later under a desk. This told me that I’d made something pretty good. I’ve made eggnog from scratch with raw eggs quite a number of times now and there are still those I cannot get to try even a sip (perhaps they too are seeing a drunk uncle puking up streams of the stuff). So this year I thought I’d try something different, something most people can’t resist. An edible cocktail. Instead of an intimidating punch bowl, I’m trying out tiny bite sized shots of the stuff. These beautiful hemispheres might not get you sloshed, but they might just be the gateway into drinking the stuff. Why? Because we’re using from scratch eggnog for the base. Yup: Raw. Eggs. In fact, you can whip up your regular eggnog for the party and then save some of the liquid to batch these up. Then maybe people will gradually move to the actual punchbowl. These taste JUST like the same eggnog and you don’t even have to garnish them. The nutmeg gradually sinks to the bottom while they’re setting, forming a lovely sprinkled top. If you’re curious about what mold to use, silicone is best for removing the jello shots. I used these mini hemispheres from World Cuisine , but you can use any shape you’d like. If you’d like to get really fancy, use a larger mold, and then serve in a tiny cup with a spoon. *Note: If you want to use store-bought eggnog or any of our flavor variations, start with 12 ounces eggnog. Pour half of the eggnog into a heatproof bowl and half into a small saucepan. Whisk 1/2 cup dark or spiced rum into eggnog in the heatproof bowl. Sprinkle 2 packets unflavored powdered gelatin onto the surface of the eggnog in the saucepan and let stand 5 minutes. Set saucepan over low heat and bring to just under a simmer, whisking constantly, until gelatin is fully dissolved; do not let boil. Remove from heat and let stand 2 minutes to cool slightly. Pour eggnog-gelatin mixture into the eggnog-rum mixture and whisk to combine. Proceed with instructions in Step 5. Place egg whites in the bowl of a stand mixer fitted with the whisk and beat at low speed until frothy, about 30 seconds. Increase speed to medium-high and beat until they are about the consistency of shaving cream, about 90 seconds. Reduce speed to medium. With mixer running, add half of sugar and beat until incorporated, about 30 seconds. Scrape whites into a large bowl. Do not wash stand mixer bowl. Add egg yolks and remaining sugar to stand mixer bowl and beat at medium-high speed until pale yellow and ribbony, shutting off machine and scraping down sides of bowl with a rubber spatula as necessary, about 2 minutes total. Add milk and cream and mix at low speed to combine. Pour half of the yolk mixture into a small saucepan and sprinkle gelatin over the surface. Let stand 5 minutes. Meanwhile, add rum to remaining yolk mixture in stand mixer bowl and mix at low speed for 30 seconds to combine. Set saucepan over low heat and bring to just below a simmer, whisking constantly, until gelatin is fully dissolved; do not let boil. Remove from heat and let stand until cooled slightly, about 2 minutes. With stand mixer running at low speed, slowly pour gelatin mixture into the yolk-rum mixture. Gently whisk in egg whites until smooth. Strain mixture into a large measuring cup with a spout. Sprinkle in nutmeg and stir gently to combine. Carefully fill your molds with the eggnog. Refrigerate until set, about 8 hours. To remove jello shots from rounded molds, carefully run a small spoon around the edge and slowly invert the mold to pop out the shot. If using square or straight-sided molds, run a butter knife around the edge and slowly invert the mold to pop out the shot. For other shapes or non-flexible molds, dip the bottom of the mold in warm water for 15 seconds, invert mold onto a baking sheet, and gently tap the mold to release the jello shot. Eggnog jello shots can be refrigerated for up to 3 days in an airtight container. 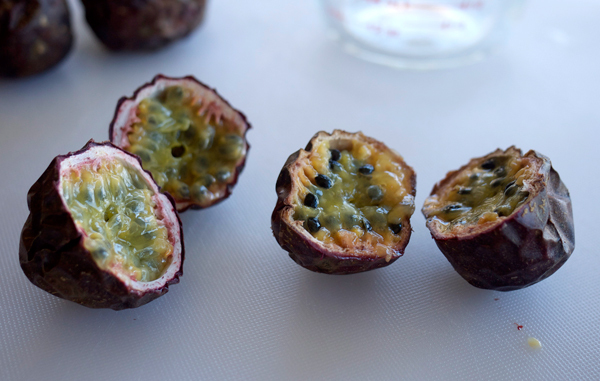 Did you know that passion fruit had a season? Neither did I until earlier this week. Big thanks to Nathan from the Chocolate of Meats blog for hipping me to this fact. If you are a lover of Tiki drinks you know that passion fruit is a major component in many of those elusive Grog Log drinks. If you’re not familiar, now you know. Pretty much though you’re stuck with commercial flavored syrups that taste more like sad kool-aid than anything resembling a fruit derived substance. Until now. My passion fruit did not come locally unfortunately, they were flown in. I thought that was the only way I would get them until I found out a local catering company, Heirloom LA, were growing them in their backyard. Note to self, plant that ASAP. So before we get to the drinks, lets get to making the syrup. If you don’t raise your hand to the question Who’s going to use this syrup up in a month? Then you can either add a 1/2 oz of vodka to the mix to prolong it up to 3 months, or make a large batch and freeze up containers to use when passion fruit is not in season. Although a basic recipe, credit goes to Tiare from the Mountain of Crushed Ice blog for some of the tips to making this syrup. Combine first 3 ingredients in a sauce pan over medium-high heat and bring to a boil. As soon as the mixture reaches a boil, cut the heat and remove from the stove. 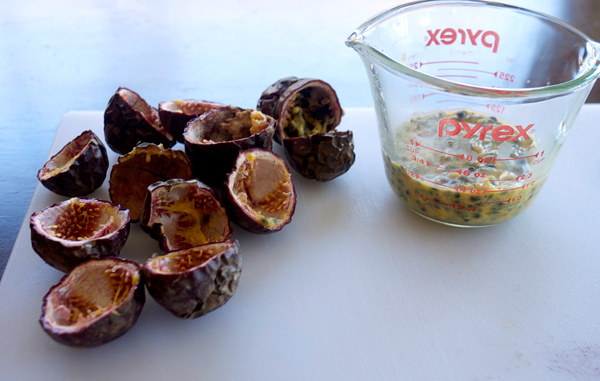 Add the juice and seeds from the last two passion fruit to the mixture, stir to combine and cover. Let this sit for two hours, then strain and bottle. Let’s ease into the Tiki now with the Hurricane cocktail. With just 3 simple ingredients this is where quality really counts. And perhaps your garnishes too. I always associated the Hurricane with a red/pink color, in fact, I assumed that passion fruit were this color too (I seriously had no idea). So to my surprise, this Hurricane really is the color of a passion fruit, yellow-orange. Dealing with the fresh passion fruit also has taught me what I smell in a lot of Tiki drinks I’ve had out of the house. The point I’m trying to make is that if you want to be serious with drinks, or food even, get to know the fresh stuff, not just what comes in a can at a grocery store, you’ll very quickly start to favor the fresh ingredients. I’ll probably be heading back to the market to buy a couple pounds of passion fruit this week just so I can make enough syrup to freeze a sizable stash. God, I just hope they’re not out of season by Tuesday. In a shaker 2/3 filled with ice, add first 3 ingredients and shake well. Fill a hurricane glass or large tiki mug with about 20 ounces of crushed ice. Strain drink over the ice and add more crushed ice if desired. Garnish with mint (give it a good slap between your hands to release some of the oils from the herb) and 3 pineapple cubes on a cocktail spear. Don’t forget that mint! 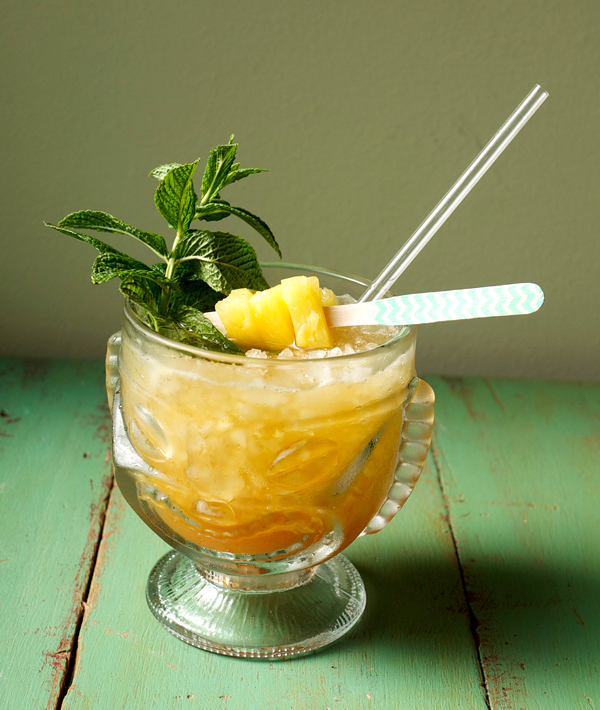 The mint adds an aromatic nose that is a perfect compliment for this sweet-tart drink. The Goslings was chosen because it gives a nice deep spice layer, while the Meyer lemon balances out the passion fruit tartness. Overall this was not what I remember a Hurricane tasting like, and that’s probably a good thing. Enjoy!